Negotiators are making progress on less contentious portions of the North American free-trade agreement – such as slashing red tape for exporters and standardizing food-safety regulations between the three countries – while punting the more difficult ones to future rounds of talks. The fifth session of the NAFTA renegotiation in Mexico City has taken on a workmanlike tone, with the three sides prioritizing easier parts of the deal. It is a sharp contrast with the previous round near Washington last month, which was marked by non-stop tension as the Trump administration hammered Canada and Mexico with a string of tough protectionist demands. Sources with knowledge of the negotiations said the United States' tone has shifted over the last month, and Washington seems more interested than before in making a deal. It was Robert Lighthizer, Mr. Trump's trade czar, who suggested that he and his counterparts from the other two countries not attend this round of talks in a bid to turn the political temperature down, the sources said. "The work is moving forward," Juan Carlos Baker, Mexico's top trade official, told reporters as he left negotiations at the Camino Real Polanco hotel Saturday evening. "The atmosphere is good." Other areas the trading partners hope to advance before the round ends on Tuesday include an expansion of the deal to cover digital commerce and provisions to make it easier for financial services companies to do cross-border business. But the sides remain deadlocked over the tough proposals advanced by the United States: A 50-per-cent American-content requirement for all vehicles made in Canada and Mexico, gutting or abolishing the deal's dispute-resolution mechanisms, limiting the amount of U.S. government contracts Canadian and Mexican firms can bid on and automatically terminating the deal in five years unless all three sides agree to extend it. Canada and Mexico have flatly rejected all of these demands. 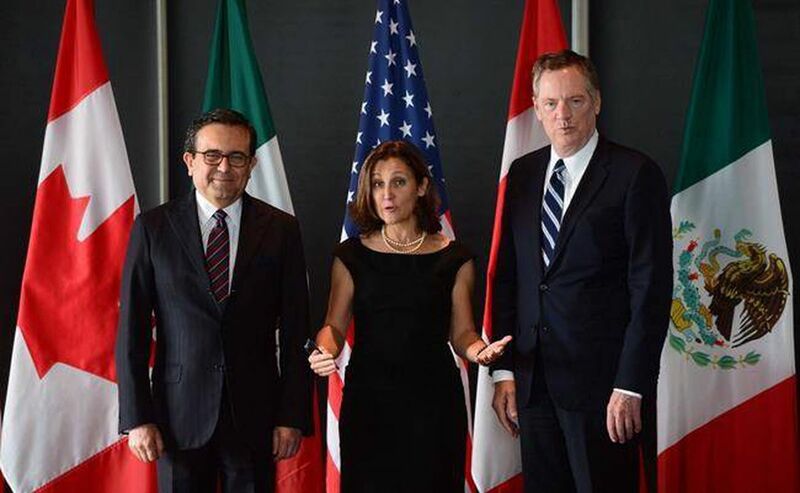 People with knowledge of the talks say the Canadian and Mexican position is that the United States must back down from these hard-line proposals before any deal can be made. When the three sides discuss autos in this round, for instance, Canada plans to deliver the United States a lecture on why Mr. Trump's protectionist proposals will hurt American industry, sources said. The Canadians contend that stringent vehicle content requirements will make the U.S. auto sector less competitive with its European and Asian counterparts, and will move jobs out of the United States as firms choose to simply ignore the rules and pay tariffs instead. Flavio Volpe, president of Canada's Automotive Parts Manufacturers' Association, said Ottawa's decision to give no ground on these demands but still remain at the table appeared to have forced the United States to get serious about negotiating. "There is some positive movement on the stuff that isn't so controversial. This is a real working round," Mr. Volpe, who was in Mexico for the talks, said in an interview. "We're back into an adult discussion." But the head of Canada's largest private-sector union said there was no hope for a deal as long as the U.S. demands on autos and dispute resolution remained on the table. "To be perfectly candid with you, talks are really not going anywhere," Unifor president Jerry Dias said Sunday morning after emerging from a meeting with Canadian chief negotiator Steve Verheul. "The Canadian team is not going to move at all as long as the United States continues to hold some ridiculous proposals." Mr. Dias said the United States is "flirting with danger" because Canada will never give in to their demands – a scenario he predicted would lead to the demise of the deal. "The odds of NAFTA succeeding, I will say, are something less than zero," he said. "[Canada is] not going to be bullied into a bad deal." Other sources, however, played down Mr. Dias's doom-and-gloom warnings, saying it will not be clear until further along in talks whether a deal can be made. It will largely be a question of whether the United States is willing to compromise on the protectionism in order to get Canada and Mexico to deal, the people said. Negotiators will reconvene for more technical discussions in Washington next month, followed by the next full round of talks in Ottawa in January.